Republican U.S. presidential nominee Donald Trump speaks at Youngstown State University in Youngstown, Ohio August 15, 2016. Donald Trump on Monday called for "extreme vetting," including ideological screening, to make sure only people who share American values and respect the American people can emigrate to the United States. The Republican presidential candidate spelled out his immigration and foreign policies to an appreciative crowd in Youngstown, Ohio who interrupted him several times with chants of "Trump!Trump! Trump!" Trump said if elected, he will institute a new immigration policy that will be tough. Would-be immigrants will go through "extreme vetting" to make sure the U.S. keeps out supporters of bigotry and hatred, and those who do not believe in the U.S. constitution, he said. Trump said he would temporarily suspend immigration from "the world's most volatile and dangerous regions" with a history of supporting terrorism. He said the immigration flow to the U.S. is currently too large to allow for "adequate screening." Trump went down a lengthy list of terror attacks carried out by Islamic extremists in the U.S. and Europe. He promised to hold an international conference on how to fight "the ideology of death that must be extinguished." He also attacked both President Barack Obama and former secretary of state Hillary Clinton for showing what he says was bad judgement in Iraq, Syria, and Libya. Trump eased away from his controversial statement calling Obama "the founder of Islamic State," saying instead that Obama's "naive words and naive actions" unleashed ISIS and "without question," allowed it to flourish. Clinton lacks the "mental and physical stamina" to take on Islamic State, Trump asserted, without saying exactly what he means. Shortly before the Republican presidential nominee spoke, Clinton and Vice President Joe Biden campaigned in Biden's hometown of Scranton, Pennsylvania where they both questioned Trump's temperament, intellect, and qualifications for entering the White House. Clinton mocked Trump's insistence that the Republican candidate knows more about Islamic State and conditions on the ground in Iraq than American generals. Meanwhile the conservative Wall Street Journal, a traditional backer of Republican ideals, said Trump is "on the path to losing a winnable race." The newspaper strongly criticized Trump in a Monday editorial, saying he would rather watch TV news talk shows instead of reading policy papers, prefers large crowds at rallies over an organized campaign, and says his "shoot-from-the-hip" style is alienating many Republicans and independents. The Journal said if Republican leaders cannot get Trump to change his act soon, they will "have no choice but to write off the nominee as hopeless." It says Trump needs to "stop blaming everyone else and decide if he wants to behave like someone who wants to be president." 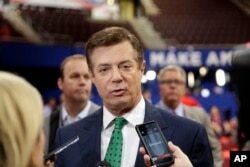 FILE - Trump Campaign Chairman Paul Manafort talks to reporters on the floor of the Republican National Convention at Quicken Loans Arena, July 17, 2016, in Cleveland. Also Monday, The New York Times reported that Ukrainian anti-corruption investigators are probing whether Trump campaign chairman Paul Manafort got an illegal multi-million dollar payoff from the pro-Russian party of former Ukrainian President Viktor Yanukovych. Manafort was a Yanukovych consultant before the deposed president fled the country in a 2014 popular uprising. The Times reports Manafort's name appeared in a hand-written ledger showing $12.7 million in cash was earmarked for him. The anti-corruption bureau is looking into whether the off-the record payment came from stolen Ukrainian government assets. There is no evidence however that Marafort ever received the money and he calls the allegation "unfounded, silly and nonsensical."